Back in 2015 the East Brunswick Hotel landed on our radar after a Herald Sun article named it as one of the best in Melbourne. We checked it out then (you can read about it here) and at the time we were relatively impressed. The pub was unrecognisable from the East Brunswick Hotel that once was, it’d be up there with our recent visit to Hardimans as one of the most drastic pub transformations we’ve ever seen. The parma was pretty good! 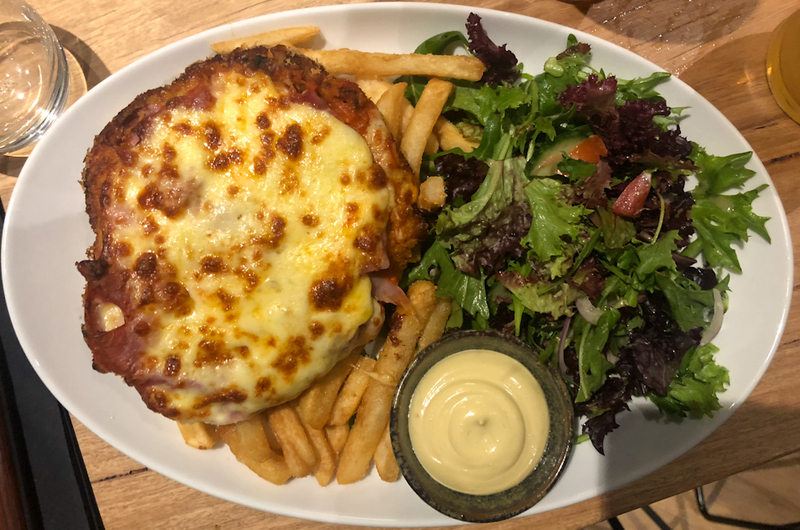 It was different to how we traditionally like our parmas here (it was hammered thin instead of giving it some thickness, shoestring fries instead of chunky chips), but it had a lot of redeeming qualities and overall it rated pretty well. It wasn’t the best in Victoria as the Herald Sun would have you believe, but as far as parmas go you could do a lot worse. Then in a weird turn of events, not long after re-opening the East Brunswick shut up shop. The details are a little bit murky but basically one day business was booming and the next the doors were locked. After that I had written it off as another old pub that would be converted to apartments, imagine my surprise when I heard only a week or so ago that The East Brunny had, once again, re-opened her doors with new owners at the helm. With new owners comes renovations, and while not as drastic as the initial transformation the East Brunswick underwent the new changes to the pub are more subtle, and to be honest, I think they’re for the better. The first time the pub was re-done they cranked it to eleven, the new owners have scaled things back to an eight or nine. Gone are the garish neon signs (which gave me a headache), the tiled floor has been replaced with wooden floorboards and large hardwood tables have really reinstated the cosy feeling that the last iteration was lacking. Live sport is definitely a priority at the East Brunny as there are plenty of TV’s around showcasing whatever is on, the centrepiece being an insanely huge screen dominating the majority of the southern wall. As the East Brunswick had only recently re-opened I thought we would easily snag a table for our review. Surely the word hadn’t gotten out so quickly that the old girl had opened her doors once more. Well I don’t know if it was due to the AFL Finals on TV (Richmond V Hawthorn) or just sheer love for the establishment, but on arrival the pub was already shoulder-to-shoulder with patrons, A rare experience for us at 7pm on a Thursday. Beer-wise there’s plenty on offer at the East Brunny. 11 taps run the gamut from Furphy to Stone & Wood to Stomping Ground, and down in the fridge behind the bartenders lies a healthy range of tins and bottles (Balter, Kaiju, Mountain Goat, VB). They’ve struck a good mix between the old standards and something with a little more flavour - Definitely something on offer to wet everybody’s whistles. 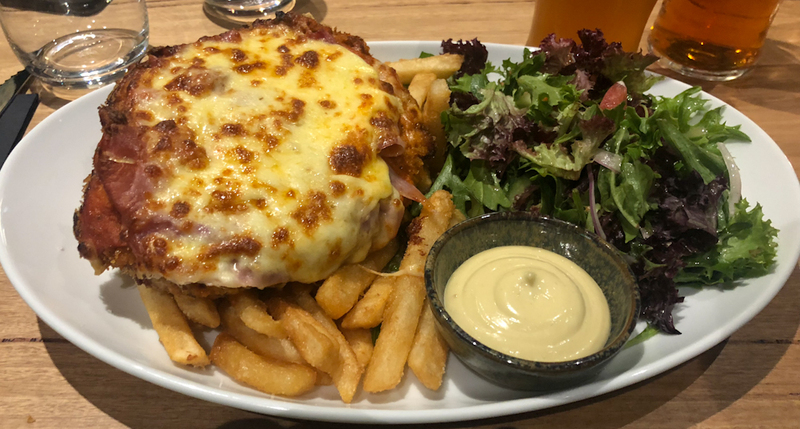 The first thing I noticed about the new parma at the East Brunswick is that it seemed like our biggest two complaints had been rectified - Specifically the thickness of both the schnitzel and the chips. More on the chips later, first up the schnitzel. A hearty piece of chicken. Well cooked and crumbed with a whole lot of crunch around the exposed edges - Unfortunately that crunch didn’t carry all the way through as the crumbs on the bottom of the schnitzel had become rather soggy in their travels from the kitchen to our table. Other than that I don’t have too many more complaints - The cheese melt was quite flavoursome and the serving of ham was extremely generous. I would have liked a little more flavour to the ham as, even though there was plenty of it, it was a little hard to detect amongst the other elements of the dish. The napoli was a point of note, a lot of the reviewers at the table likening it to more of a bolognese sauce that a napoli (not that it had ground beef through it, more of an “overall vibe” feeling). I could have used a little more napoli on my parma as I didn’t quite get the same notes that they did, however after 8 years of reviewing parmas with this group I have learned to take them at their word on occasion! Despite a few minor quibbles the parma at the East Brunny was super enjoyable, and definitely an improvement on its 2015 predecessor. The chips were straight up fantastic. Gone is the bowl of shoestring “maccas” fries and it their place is a massive serving of beer battered beauties. Cooked to crunchy perfection with piping hot pillows of potato inside. Well seasoned with a side of aioli (tomato sauce was also offered) thrown in on the side for good measure. Excellently done. The salad was the weakest of the bunch. A decently sized serve but there was just nothing to it. Some oily lettuce leaves with a bit of onion, cucumber and tomato (and some of the reviewers around the table didn’t even get the tomato). After such a solid showing with the parma and chips the salad felt like an afterthought. Definite room for improvement here. My experience at the East Brunswick was quite good overall. The venue was warm and comfortable, solid timber bar & tables adding a couch of class along with TV’s spaced throughout and a good variety of beers on tap. The parma was a great size, real chicken breast and quite thick. I didn’t love the sauce, nor did I hate it, I felt it was closer to a pasta sauce than a parma sauce. The chips were well seasoned, in abundance and went fantastically with the supplied garlic aioli. The salad let the meal down a little, just your run of the mill gourmet salad mix with 2-3 pieces of tomato and I’m not 100% sure there was dressing on it as it was quite dry. I’m a salad fiend so my standards are high - The tomatoes were soggy and the leaves were limp. Very little onion and our salads were inconsistent (ie. I had tomato but Stefan had none). As far as value for money goes I’d rate this parma pretty highly. The serving of chips was massive, the aioli was chucked in for free as far as I’m aware and all the ingredients (other than the salad) were of the highest calibre. I’ve had a quick squiz around the East Brunswick’s website and social media pages and as far as I can see there aren’t any parma nights on the books as yet, but to be honest I’d happily chip in another $24 for the parma we received. Oh and its also worth mentioning that during this review we were shadowed by the lovely Rachel from the Moonee Valley Leader. If you live in the Moonee Valley region be sure to keep an eye on the next issue as we may be making an appearance! (Ill be sure to update our facebook when it drops). All up I’m quite impressed with the East Brunswick. The renovations have given the pub a much more inclusive, local pub atmosphere compared to what it was. The parma was damn fine, let down by a lacklustre salad offering, but otherwise definitely worth checking out.